ango was born around 1880, developed in the cities on both banks of the Río de la Plata (River Plate) and soon thereafter it spread internationally. 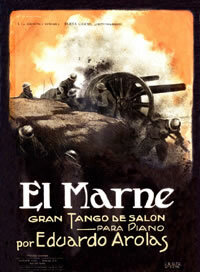 Not only to the remaining countries of the Spanish America but also to Europe and, especially, to France. We acknowledge three artistic dimensions in tango: music, dance and poetry. In its origins it is only music to be danced among men in whorehouses and their adjoining places for gambling and alcohol and soon it spread to the suburbs and poor marginal areas of Buenos Aires and Montevideo. There were almost no lyrics; only in some cases some refrains and words with picaresque meaning were sung, matching their original environments. In the first decade of the twentieth century the early tangos began to arrive in Paris and French people liked them very much so they asked for them at dancehalls. 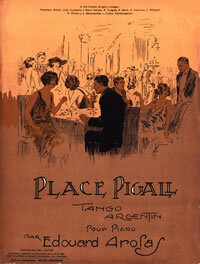 Then tens of Argentine musicians and dancers traveled, tango orchestras and groups were put together and dancing academies were established all over Paris. The echoes of those triumphs quickly reached the Río de la Plata and the Argentine high society that had looked down on it, began to accept and enjoy that dance from the outskirts that now came back home with a highbrow music degree. But poetry was still absent, its «third dimension». (Director's note: To know our position on this issue we suggest the article: Reflections about the origins of tango). Although there were several previous attempts, only in 1917 it is officially recognized the first tango-song “Mi noche triste (Lita)”, with lyrics by Pascual Contursi written on the music of a previous tango, “Lita”, by Samuel Castriota. 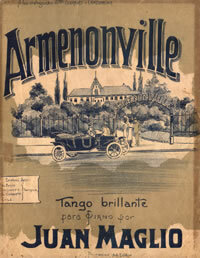 It was premiered by Contursi himself in Montevideo and that same year Gardel recorded it with the accompaniment of only one guitar. After that, all the subject matter of the universal literature and poetry began to get space in tango pieces: love and betrayal, friendship and nostalgia, illusion and memories, pain and joy. The best poets contributed with their artistry to tango lyrics and, maybe they succeeded in making, as Borges prophesied, that the true Argentine poetry of the twentieth century is to be found in the imperfect and popular tango lyrics. («… it is plausible that towards 1990 the suspicion or the certainty that the true poetry of our time is not in La urna de Banchs or in Luz de provincia by Mastronardi but in the imperfect pieces that are treasured in El alma que canta». Jorge Luis Borges: Evaristo Carriego/ Historia del tango/ Las letras, 1930, page 163). Concurrently, at that time –the first decades of the last century- great European migratory currents arrived in South America, thus enriching the Spanish language with terms, expressions and words from very different countries. 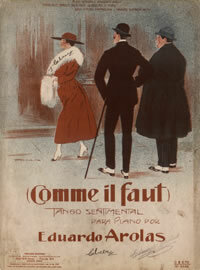 That is to say that the infatuation was reciprocal: As France had fallen for tango, tango was also in love with France. Then tango lyrics were flooded with French identity signs and were picking up patches of Paris, of the French language and of the French culture. So it was that names, words, terms, phrases, idioms, references to streets, squares, avenues, neighborhoods, cities, monuments, persons, characters, its history, its literature, its opera and many other artistic and popular expressions of that great country remained present forever among us. They were included and adopted as our own in the lyrics and in the titles of hundreds of tangos, waltzes and milongas of the River Plate area. In many cases, with the logic variations in spelling and pronunciation, consequence of the language differences, but always with the indubitable intention of «parler en français» (talking in French). The book El francés en el tango collects over 150 French terms and references in the lyrics of 177 tangos by 90 authors of all times; but these figures in no way exhaust the subject, because if only we counted the tangos that in their lines contain the words champagne (champán), cabaret, Paris or Montmartre the count would reach several hundreds. The subject about French in tango cannot be exhausted in these few words but one of the greatest tango poets of all times: Enrique Santos Discépolo, the author of “Cambalache”, “Esta noche me emborracho” and so many other worldwide famous tangos made the best summary of it. In the lyrics he wrote in 1947 for “El choclo” on the music Ángel Villoldo had composed thirty years before, Discépolo tells us —once and forever— that tango crossed the seas «… and in a Pernod mixed Paris with Puente Alsina». This mixture turned out eternal, confirming that what the early tango men brought to Paris, more than a hundred years ago, was the beginning of a solid intercultural link of great magnitude.